Gonzo feminist shocks meets male-gaze fantasy. Feminism comes out on top – just. With an aesthetic that splices together Vice, a 17-year-old’s Insta feed, and a whole Urban Outfitters floor’s worth of ’90s redux fashions, Sam Levinson’s horror flick feels vividly, effortfully 2018. It’s a woker-than-woke, Gen Z-focused tale of a gang of teenage girls who take on their entire town after they’re wrongly blamed for a data leak. 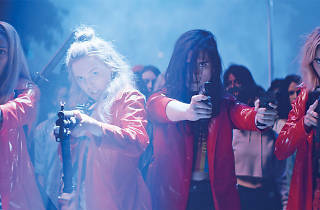 ‘Assassination Nation’ might look modish but there’s nothing new about the misogyny it centres on. It’s set in a suburb called Salem – appropriately, given the witch hunt which swirls around its four female leads after an anonymous hacker exposes the town’s men for the sext-happy perverts they are. Alas, Levinson’s approach to this put-upon posse is a little backwards-looking, too. These girls spout a whole Twitter-feed worth of feminist debates. But this is still a film that relies less on three-dimensional female personalities, and more on the visual lure of their bodies in bum-skimming hotpants – and on the looming threat of the men who hunt them down. Where the legendary Burn Book in ‘Mean Girls’ unleashed untold teen feels, we’re expected to believe that this one-dimensional sisterhood barely wavers in the face of a tidal wave of gossip and violence. 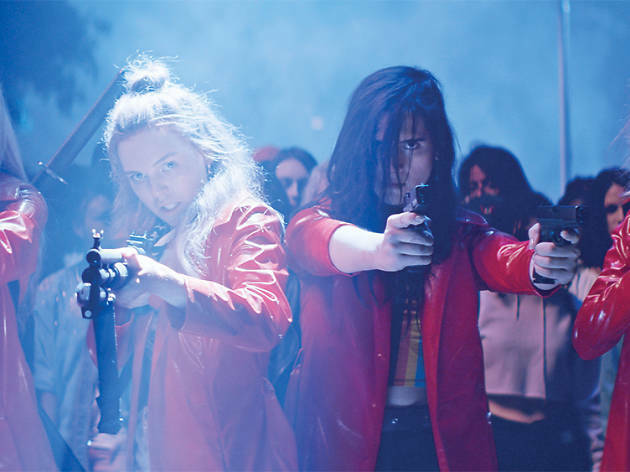 Still, what ‘Assassination Nation’ lacks in nuance, it makes up for in hyperactive, hit-and-miss creativity. These girls’ instant-messenger convos flit across the screen in real time, adding suspense to satisfyingly gory scenes where they magically always come out on top. In twenty-first-century Salem, the witches hunt back.